Learn more about where to find help if you suspect that your child may have a developmental delay. A developmental evaluation will be used to decide if your child needs early intervention services and/or a treatment plan specifically tailored to meet a child's individual needs. Think of all the skills that children have to learn when they come into the world: smiling, turning over, responding to people, communicating, eating solid food, crawling, standing, and on and on. We expect these skills to emerge naturally over time and know more or less when they should. At 3 months, Susana will probably be doing this, at 4 months, she'll be doing that. By a year, well, she'll be tottering around, getting into everything. This time-table for skills to emerge is commonly called the developmental milestones. What's considered normal development is described rather broadly, in recognition that children don't necessarily learn skills at the same pace. Two different children born on the same day may learn the same skill months apart, and both can be considered "on schedule." It's when skills don't emerge as expected, more or less on that broad schedule, that parents and caregivers may become concerned. If you're reading this, perhaps you've become concerned about your child or one you care for. We're glad you're here, because there are many immediate things you can do to learn more and help your child. First, know that there's help available to find out just what the difficulties are, if any, and there's help available to address those difficulties. The good news is that this help is usually free, and it's available in every state. First, you may want to talk with your pediatrician about your child's development. Don't be surprised if the pediatrician tells you not to worry, to be patient, to give your child more time to develop. Often, that's what parents hear, especially in the early stages of investigating their child's seeming delays. And it's often true. Children develop at different rates; the pediatrician is well aware that many children show sudden bursts in development rather than slow, steady growth. On the other hand, your pediatrician may recommend that a developmental screening be conducted to see if, indeed, your child is experiencing a developmental delay. The screening is a quick, general measure of your child's skills and development. It's not detailed enough to make a diagnosis, but its results indicate broadly whether or not a child should be referred for a more in-depth developmental evaluation. States have an affirmative obligation to help children who are experiencing a developmental delay in one or more areas. Through the Child Find system that states operate, developmental screenings and developmental evaluations are typically provided free of charge to families. If you're concerned about your child's development, talk to your child's pediatrician, who can refer you to the Child Find system in your area. 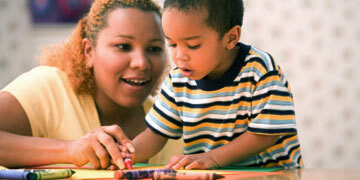 Early intervention services are meant for children under the age of three. They typically are provided to eligible families either free of charge or on a sliding payment scale that's determined by the family's income. You can find out how to access early intervention services in your area by talking to your child's pediatrician, calling a local hospital, or using the NICHCY State Resource Sheet for your state. Once you select a state sheet to view, look under "Popular Searches" on the right side of the screen, and select "Early Intervention Programs." NECTAC (the National Early Childhood Technical Assistance Center) is also a great source of this information. Use NECTAC's Contact Finder located under "State Programs Under IDEA" and select "Part C Coordinators. Special education services are meant for children over the age of three. Services are provided to eligible children free of charge through the public school system. If your child has passed his or her third birthday and you're concerned about a developmental delay or disability, call your local school (even if your child isn't enrolled there) and ask how and where to have your child evaluated under IDEA, our nation's special education law. It's a good idea to find out if your state has added details to this definition of developmental delay. States are allowed to do so, if they choose. They also decide on the age range of children with whom the term may be used (3-5, 3-9, or any subset between 3-9). Your local school or early intervention program should be able to tell you the definition of developmental delay that's used in your area. You can also visit NECTAC (mentioned earlier) and find out how your state defines developmental delay, as well as the criteria of eligibility for services to young children, birth through 2 years of age, and their families. It's very helpful to read more about developmental delay. This has been just a brief overview, with pointers to loads of additional info and support. Below, we've identified a range of materials you can explore, which will of course lead you to still more! Child development: All about child development from the CDC, the Centers for Disease Control and Prevention. Developmental screening: From CDC, the Centers for Disease Control and Prevention. What is developmental delay? From How Kids Develop. Developmental delay: From the Encyclopedia of Children's Health. Developmental delays: From Keep Kids Healthy. First Signs: All about early detection of developmental delays and disabilities, especially autism. Connect with other parents: Interested in talking to other parents whose children have developmental delays? Try Parent to Parent. They'll connect you with other parents like yourself for support and exchange. State eligibility definitions for infants and toddlers with disabilities under IDEA: Find out how your state defines developmental delay and criteria of eligibility for services to young children, birth through 2 years of age, and their families. Connect with the disability community and parent expertise: Every state has a Parent Training and Information Center, known as the PTI. Some states have several. If you are looking to connect with state and local resources, or have questions about services and parent rights, talk to your PTI.